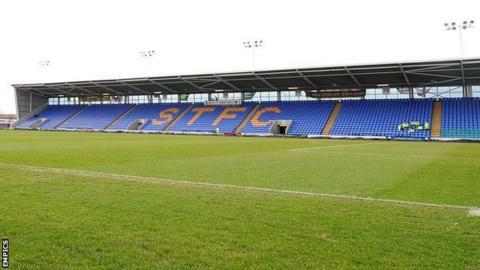 The Football Association has begun an investigation following complaints from two Shrewsbury players that they were racially abused at Hartlepool. Striker Marvin Morgan took to Twitter following Saturday's 2-2 draw to claim he and defender Jermaine Grandison were abused by members of the home crowd. The incidents were included in referee Carl Boyeson's match report. An FA spokesman told BBC Radio Shropshire that they were "aware of and investigating" the issue. A club statement said: "Shrewsbury Town FC can confirm that [manager] Graham Turner and players, Marvin Morgan, Jermaine Grandison and captain Matt Richards were called into the referee's room where discussion took place at half-time on Saturday regarding racial comments directed at the players. "We understand the referee included the conversations in his match report to the Football League. "The matter is now subject to a police and FA investigation and no further statements will be made." Pools have backed the investigation and say they will perform one of their own. A statement on the club website read: "The club will do everything possible to help with any external investigation and we are currently carrying out our own internal investigation. "The club would like to remind supporters that racism in any form will not be tolerated at The Vic, as the club have shown in its ongoing involvement in the Kick It Out campaigns."